The HY-TTC 500 family consists of high-end safety control units designed to satisfy upcoming needs for a wide range of high-end applications in the automotive industry. It can be used in car prototyping and development as an engineering platform with AUTOSAR standard software as well as a powerful control unit e.g. for powertrain or vehicle dynamic control systems – even in low volume series production. The extensive I/O set with various configuration options makes the HY-TTC 500 controllers suitable for a wide range of high-end applications: For example, a group of 8 I/O pins can be individually configured for use as voltage output, digital output or analog input. Another use case is to build up a centralized architecture using one HY-TTC 500 controller for the whole vehicle. Commissioning time can be improved by using Ethernet for downloading and debugging purposes. The freely programmable high-end controllers with a powerful dual-core ARM Cortex®-R4 lockstep processor are protected by a compact, automotive-style housing suited for harsh environments. The controllers fulfill safety requirements of IEC 61508 SIL 2 and EN ISO 13849. They can be programmed either in C or in CODESYS®. The safety certified CODESYS Safety SIL 2 with its validated compiler and code generator speeds up application development significantly. The majority of run-time tests that are needed to achieve the diagnostic coverage required for ISO 26262 (certifiable up to ASIL C) is performed in hardware by the dual-core lockstep CPU and its safety companion. Therefore almost the full processor power is available for the application. The available memory protection mechanisms allow to execute safety-related and non-safety-related software on the same ECU with freedom from interference. The time-consuming validation of non-safety-related software parts is therefore no longer necessary. Safe data communication is achieved by the standardized software modules (i.e. AUTOSAR E2E-protection or CANopen Safety protocol). In case of a safety-related failure the outputs can be shut off in 3 groups allowing limp-home functionality. Starter/development kits are available for working with this ECU. The kit is delivered in a handy case and the advantage lies in the fast orientation and development with the HY-TTC 500, as well as cost savings compared to the individual prices of the contained products. The development/starter kits allow access to the web-based service area, which contains program examples, latest documentation, workshop documents, current releases and necessary SW tools. 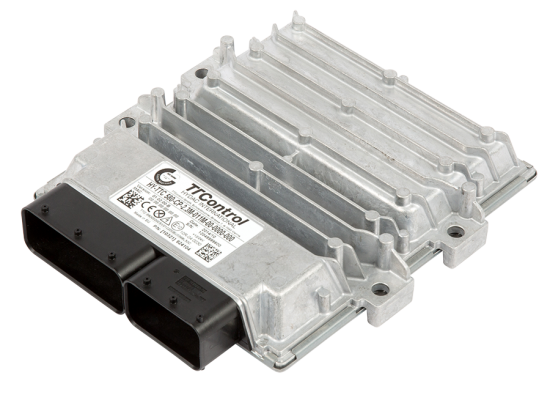 This product is supplied by TTControl and distributed for the automotive market by TTTech Auto. For software updates and other technical information, visit the TTControl service area. If you need access, please get in touch with your TTTech Auto sales contact.